Weighty Matters: American Academy of Family Physicians peddles snake oil & multi-level marketing? American Academy of Family Physicians peddles snake oil & multi-level marketing? 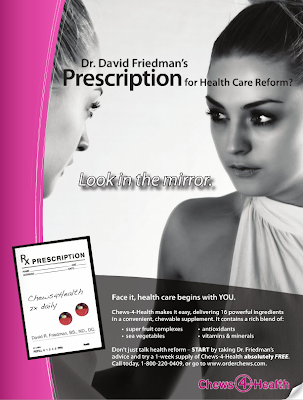 You see the American Academy of Family Physicians published some interesting advertisements in their 2009 Healthy Living magazine, something they bill as part of their, "AAFP Patient Education Program". So about which products did the AAFP want to educate patients? "the key reason why your energy levels drop and you slow down"
"These statements have not been evaluated by the Food and Drug Administration. This product is not intended to diagnose, treat, cure or prevent disease"
And we all know that everyone always reads the teeny-tiny fine print, right? Next up is Chews-4-Health - a chewable dietary supplement designed by Dr. David Friedman, a chiropractor. Dr. Friedman has the very dubious distinction of being featured prominently on Quackwatch for his involvement with a product called Seasilver. According to Quackwatch, Dr. Friedman was Chairman of Seasilver's advisory board and participated in infomercials that claimed Seasilver could cure cancer and other diseases. Thankfully the Federal Trade Commission reigned in Seasilver and banned Dr. Friedman from making unsubstantiated claims about it. Perhaps that's why Dr. Friedman has moved on to new ventures? "may aid in promoting healthy organs"
Oh and guess what? To make things even less savory Chews-4-Health appears to be a multi-level marketing scheme. 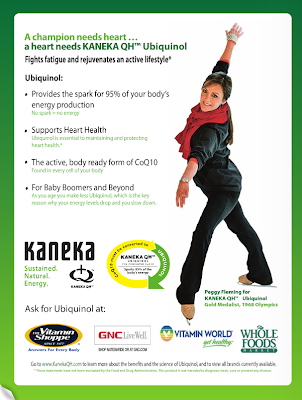 "Chews-4-Health has a powerful full-page ad in Healthy Lifestyle Magazine, which is sent to 95,000 family physicians each month! The American Academy of Family Physicians (AAFP) HAND PICKED Chews-4-Health for the coveted back inside cover, and offered EXCLUSIVITY—meaning Chews is the only dietary supplement advertising in the magazine! Over 240 MILLION patients visit AAFP doctors each year!! Additionally, Chews-4-Health will be featured on its website, www.familydoctor.org, which gets 3.5 MILLION unique visitors each month! All sign-ups from these doctors go to the NLM"
Isn't it great that the American Academy of Family Physicians is including Chews-4-Health in their "AAFP Patient Education Program" and that they "hand-picked" it for the "coveted back inside cover"? "Neither this book, nor its contents constitute an implied endorsement by the American Academy of Family Physicians (AAFP) or by Boston Hannah International of the products or services mentioned in advertising or editorial content." "The editorial content in this publication does not necessarily represent policies or recommendations by AAFP." If you know a member of the AAFP, please kick this post their way.